A place of inspiration is any place which arouses strong emotions, or perhaps memories, dreams, or reflections. The Castle Inn at Edgehill Oxfordshire is one such place. A tavern was first built in this high location in 1742 – one hundred years after the date of the Battle of Edgehill which took place in the valley below. There, on 23rd October 1642 the forces of the Parliamentarians and the Royalists faced each other in the open field between Kineton and Radway. The English Civil War was just beginning. The King’s forces had been on their way to London via Birmingham and Kenilworth. The Parliamentarian forces had been heading for Worcester. And they accidentally came together in this bloody battle. The Civil War should have ended there. But it didn’t. The battle ended indecisively, but if the royalist forces had marched straight to London they would have gained the advantage, and the war would have been over. Instead, they made one of those fateful wrong decisions upon which English history so often turns. The Parliamentarian forces got to London first, and a cruel war ensured. King Charles I had lost his best chance to win. His own personal story ended when he paid the highest price for his errors and bad choices, by being beheaded. One of England’s most evocative and compelling ghost stories lingers around this place too. Since the time of the battle, haunting sounds and apparitions have been reported by many, at night, and particularly around the anniversary of the battle. Above all this, the Castle Inn sits with its folly in the form of a castellated tower (in which you may book an overnight stay), a picturesque and intriguing attraction at Edgehill, offering refreshment, delicious meals and excellent service in its delightful beer garden, refurbished dining room and historic bar. It’s one of my favourite pubs to visit, here in the heart of England. Though its attendant history is very sad – see the exhibition now on display at St Peter’s Church Radway – being a story full of tragedy and cruelty and fate, of the kind we love to reflect upon from our safe distance of centuries: until we start to compare it with several current situations of conflict in the world today. Such, to me, qualifies it to be a place of spiritual resonance, because it affords us an opportunity to reflect upon our own lives, and upon the human story and its twists and turns of fate, from our perspective of centuries after the original historical events. When a place evokes strong feelings of pity, poignancy, compassion, to my mind, that makes it a special place. And by the way the interior is delightful, the views are magnificent, the service excellent and the menu thoroughly enjoyable! When thick snow arrives it transforms our world, for as long as it stays on the ground and on the trees, on the rivers and ponds. The fascinating thing about snow – as an occasional visitor to our familiar landscape – is how it acts as a catalyst for the negative and the positive in human nature. However you see life, seems to be encapsulated in how you react to the sudden arrival of snow. As a child I was very romantic about snow. I never saw the negative side. But as adults we can see inconvenience, closure of schools and colleges, cancellation of social events, cars skidding and sliding, accidents and piles of dirty slush. Or we can choose to see it as millions of exquisite, miraculous ice crystals, as an agent for transformation, as a way of seeing the world through new eyes, even if only for a relatively short period of time. Near our home, the Saxon Mill pub, Warwick, is a popular venue. Situated on the river Avon by a bridge over a weir, with the atmospheric ruins of Guys Cliffe house on the horizon, it is a romantic, historical place to which people are attracted in huge numbers – at certain times of year. I love visiting it at any time of year but especially in the snow. For some of my other posts about eerie, mysterious Guys Cliffe House, and about the romantic appeal of the Saxon Mill, click here and here. On 7th September 2017 on the seventh day of my Mystical Circles blog tour, MJ Mallon published an article by me on her blog which has the wonderful title of Kyrosmagica. This is the seventh in a series of blog posts in which I re-publish the articles on that blog tour. Being an author in today’s world is a much tougher journey than one might ever believe, when one first conceives the desire to write stories. I was inspired at the age of seven by the adventure stories of Enid Blyton and wanted to write exciting stories like hers. Essentially my desire was to write about girls my own age doing thrilling and dangerous and intrepid things quite out of my own daily experience. I created two girls called Marilyn and Sylvia and wrote many stories about them. They were good, brave, beautiful, clever and talented, everything I wanted to be. In other words, the desire was for transformation. And this is why I believe we read fiction. Our longing is to be transported from out of our own lives, our own minds, into the mind and heart of someone else, to enter into a different world, to be inside someone else’s skin, to share his or her joys and sorrow and hopes and dreams. Listening to conversations and observing people and the interaction of their personalities has long fascinated me and is a large part of my desire to write. I wrote a detailed daily journal throughout my teens and twenties, which ran to many volumes, and in it I would often record conversations I had been a part of or had overheard, and observations about people I knew, including family relationships. The changes in the publishing scene over the past couple of decades have held out a seductive allure to independent authors, offering power and autonomy. Yet the snares along the path are even greater. We have all these opportunities, but also there are many people pursuing the same dream, and recording their success and offering their advice on social media. This can prove overwhelming for sensitive, introverted creative people – which is the case with many writers. So it can prove a lifeline when we find inspiring quotes to strengthen and uplift us. Here’s one, from St Paul: But one thing I do: forgetting what is behind and straining towards what is ahead, I press on towards the goal to win the prize. And he also encouraged his readers with these words: Only let us live up to all we have attained. Knowing that others have struggled for years and eventually, with persistence, won through, is a very helpful reminder for us when we start to doubt the value of our past achievements and allow it to weaken our faith in what we are capable of achieving in the future. My non-fiction book Perilous Path, an inspirational writers’ guide, contains several chapters which help authors to overcome obstacles in their path, and suggest how to use art and music as therapy as well as a source of fresh inspiration. So, finally, what makes us carry on? We need to draw the water of inspiration and motivation from a reliable well. I found one particular saying of Sir Winston Churchill very powerful. When invited to speak to an audience of school pupils, who were all waiting to hear wise words from the great man, he said, I only have five words to give you. Never, never, never give up. I was born and brought up in Orpington, near south London. As a child I was inspired by Enid Blyton. I started writing adventure stories at the age of seven; the love of writing that her stories first instilled into me has strengthened over the years. I studied English Literature at Lancaster University, and my first permanent job was as a production secretary with the BBC. Later I lived for nearly five years in Australia before returning to live in the UK. I now live in Warwickshire with my husband David, son Jamie and daughter Abigail. Nearby are three of England’s most famous destinations: the Royal Shakespeare Theatre at Stratford-upon Avon and the two great castles at Kenilworth and Warwick. 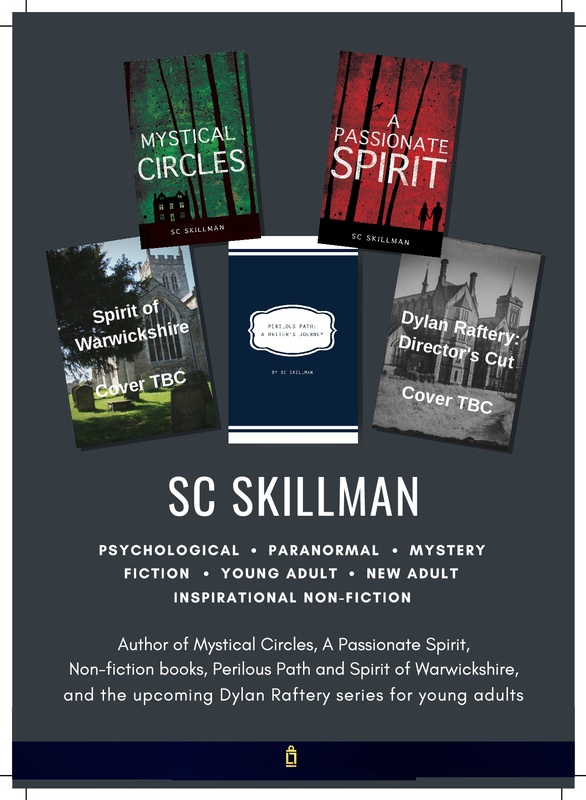 My two thriller suspense novels Mystical Circles and A Passionate Spirit are set in the beautiful Cotswolds hills, not far from my present home. I’ve also written Perilous Path: A Writer’s Journey, a book of encouraging advice, tips and reminders for authors. I am currently working on the second draft of my new novel, Director’s Cut. I’ve always been fascinated by the interaction of different complex personalities, an inexhaustible source of inspiration for a writer! And my advice to anyone who wants to be a writer? Read a lot, listen to people’s conversations, be observant about the details of your world, and especially about human behaviour and interaction, and persist in your writing, being single-minded to the point of obsession… never give up, always believe in yourself despite all evidence to the contrary, and hold out for what you first dreamed of. I’m delighted to welcome M.J. Mallon to this blog today, to promote her new YA/Middle Grade fantasy novel The Curse of Time, due out on 26th August. I’m very interested in magical realism and this is the subject of the guest post featured today. I was also intrigued by some of the author’s inspirations including the amazing art installation “The Light Pours Out of Me” and also the work of the inventor Dr John C. Taylor, to whom the author is indebted for the image of his Corpus Chronophage used on her book cover. Find links to their websites below; they are well worth browsing. Published by Kyrosmagica Publishing, ‘The Curse of Time’ is available for purchase here. Thank you to Sheila for inviting me to talk about my book. The Curse of Time, Book 1–Bloodstone, a YA urban fantasy set in Cambridge, England. Did I plan this? No, not at all, if anything my writing evolved in a haphazard way with little structural planning. I’m not sure I would suggest this is the best approach to follow as it leads to numerous frustrating edits and re-edits. But in its favour it taps into unhampered creativity which is of enormous benefit. One location, Clowns coffee shop has recently closed down, an independent coffee shop in Cambridge, but it is forever immortalised in my novel! Crystals feature in the novel, inspired by my visit to The Light Pours Out of Me, by Anya Gallacio at Juniper Artland. The Bloodstone photograph below is courtesy of my lovely blogging friend, Samantha Murdoch who blogs here. I prefer writing magical realism to high fantasy; it grounds the fantasy making it real and more accessible and marketable too! I expect that The Curse of Time, Book 1, Bloodstone, will appeal to bright youngsters, teenagers and older people too. I believe there is something for everyone, (and food for thought too,) whether you are eleven or 99. If you are a fan of fantasy, I expect and hope you will enjoy it! I am a debut author who has been blogging for three years. My interests include writing, photography, poetry, and alternative therapies. I write Fantasy YA, middle grade fiction and micro poetry – haiku and tanka. I love to read and have written over 100 reviews. I have devoted the past few years to writing over 100 reviews on My Goodreads Review Account, and on my blog to help support traditional and indie writers. and slipped into Austria where we had a lot of fun on the Sound of Music Tour in Salzburg. But the most outstanding feature of our holiday was our discovery of a truly intriguing character: King Ludwig II. Ludwig was a dreamer and visionary whose image is now ever-present in Bavaria. Whilst visiting his three castles – the castle on an island in a lake, Herrenchiemzee, the fairy-tale like apparition high on a mountain crag, Neuschwanstein, and the exquisite vision in a valley, Linderhof, I was fascinated by his romantic idealism, his passionate devotion to the idea of being “an absolute king” dwelling in Castle Perilous, his love of immensely rich and precious interior decoration, his total disregard of the practical implications of his various passions, and his intense relationship with the great composer Richard Wagner. His story was often tragic, and his end terribly sad – he was declared mad and killed – yet Bavaria thrives on his legacy today. I’m delighted to host author Vivienne Tuffnell today on my blog. I’ve followed Vivienne’s blog Zen and the Art of Tightrope Walking now for several years, and reblogged one of her posts here; I’ve also read four of her previous books: Depression and the Art of Tightrope Walking, Square Peg, Away With the Fairies and Hallowed Hollow. Today she is here to talk about her inspiration for her new novel Little Gidding Girl. Now it’s time for Vivienne to tell us how the ideas for this novel first came to her. You’ll find my 5 star review of the novel at the end of this post. “We’re all mad here,”- the inspirations behind Little Gidding Girl. One of the questions most writers get asked from time to time is “Where do you get your ideas?” and it’s also the most difficult to answer because it varies enormously for each writer and for every book. But being asked, “What was the inspiration behind your book?” is often simpler because it’s more precise. So when Sheila asked me about the inspiration behind Little Gidding Girl, the real difficulty was casting my mind back about fourteen years ago to a period when I was almost bursting with creativity and ideas and winnow out what really inspired that particular book. We’d moved to a new area and that is something that is always unsettling and unnerving, and within a few months of arriving I began writing again. I’d turned my back on writing for all sorts of reasons. Roadblocks where agents and publishers would take up a book with interest and then reject it or ask me to rewrite and then reject it again, created such tension in me that I became ill, almost fatally so, and to save my health and my sanity, I stopped writing altogether. Eight years had passed where I’d written nothing longer than a letter, when a whole novel sprang to my mind and poured out almost uncontrollably in an unprecedented flood. More novels followed, Little Gidding Girl being among them, but its origins lie (as almost always for me) within the unconscious mind. I’d begun dreaming again. Powerful, vivid, compelling and often lucid dreams that left me exhausted and haunted. One afternoon, I had a snooze and thought I’d woken up, and was getting dressed in brand new jeans that required a coat-hanger to ease the zip up, when my son burst into the room demanding something or other. He hadn’t knocked and I was upset and cross with him, and humiliated because the jeans were so tight, I had visible muffin-tops of fat spilling over the waistband. The thing is, I don’t have a son. I’ve never had a son, only a daughter, who at that stage was in her early teens. I woke again, properly this time, rather shocked and shaken by this experience. I made a note of the dream and let it go. More odd dreams followed. In one I was in a school science lab, attempting to teach something I didn’t understand, when the lab bench started to fade in and out and be replaced by a flower bed. In another, I went to the bottom of my garden to discover a massive trench (like in Time Team) and a row of shelves with finds laid out on them. But the finds were all modern rubbish and not archaeology. A whole series of extraordinary dreams occurred, leaving me spell-bound and baffled, because they all seemed to connect to a life I’d never had but might have done. Like many women, I’ve experienced the loss of pregnancy in miscarriages. I’ve never grieved much, for those potential babies, but I have always felt a tiny bit sad that life circumstances and the revelation that I’m not much good with babies and children led me to decide that one child was all I should have. In another universe I might have been one of those earth-mother types, perhaps, but not in this one. Around the same time, I’d begun to be a bit obsessed with Four Quartets. I’d never studied it at university, and a quote somewhere set me to seek out a copy and read it. It seemed to hold so much, so much that science and religion in their blunter, less mystical forms, simply did not express in ways I could relate to. I began to think about the paths I never took, the doors I never opened, the rose gardens I never stepped into, and it felt like the dreams were showing me glimpses of those other realities that never happened. Any belief that other paths might have been nicer, sweeter or more successful than the one I did take soon began to crumble. In the Narnia books, Aslan says that no one is ever told what would have happened, and yet, sometimes I believe we are shown a tiny vision of the other lives we might have lived. Sometimes it’s to comfort us, sometimes it’s to inspire us but always it is to root us in the reality of what is rather than what might have been. Thank you Vivienne – this gives a fascinating insight into the background to your novel. I too have long been interested in paying attention to and recording dreams, and to learn that you were inspired to write Little Gidding Girl by your dreams particularly intrigues me. A very sensitive book which represents an unusual exploration of grief and blends it with the philosophy expressed by TS Eliot in his poem ‘Little Gidding’ from ‘The Four Quartets’. The main protagonist Verity is living with unresolved emotions from the accidental death of her boyfriend nineteen years earlier. Though her present-day marriage is ostensibly happy and her life relatively comfortable, she has never stopped engaging on an unconscous level with the life she imagines she would have lived, had that boyfriend not died. Vivienne Tuffnell handles the female relationships in Verity’s life with sharp perception and wit, and I loved her descriptions of the New Age shop that Verity works in, whilst being exploited by the rather unpleasant owner of the shop, manipulative therapist Juliet. Verity’s “visions” of that alternative life are also handled in such a way that the reader strongly feels their weirdness and they carry a considerable shock factor in the narrative. Earlier on in the story I found Verity’s present-day husband a little too gentle and calm and sympathetic, but later on we come to share some of his own turbulent feelings at the strange inner journey his wife is taking. I loved this quote near the end of the story: That’s what grief is. A little bit of us dies when our loved ones do. We go down into death with them while the grief endures. When the grief pales we return with what gifts our loved ones gave us in life. A very thoughtful and haunting novel. Vivienne is a writer, poet, explorer and mystic.